Q. 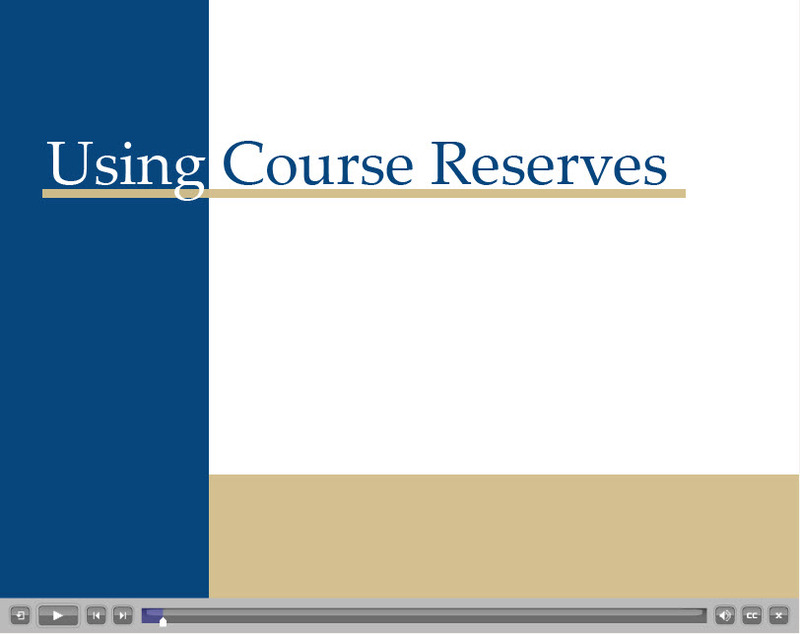 How do I access my course reserves? Watch this short two minute tutorial or read the text description below. Reserves may be available electronically or in print at the Library. Instructions for finding both are below. 3. Search for materials by instructor's name and/or course. Use the drop down arrow to select your instructor's name, then cursor down to select the course number. 4. You'll see a list of all materials on reserve for that course. 5. Select the title of an item by clicking on the title that begins with ".Click E-Items Link." Items beginning with this entry are the E-Reserves for your course. 6. You'll see the brief record, which will have a web link. 7. Click on the "E-Items" web link to access your E-reserves reading. 8. The system will prompt you for a logon and password, you must enter your UTA NetID and password to be able to view the article and or chapter. You'll see a list of all materials on reserve for that course. Note that all E-reserve readings will be listed first, followed by the On-Site Reserves. Write down the call number for the reading you need, then go to appropriate Library to check it out (either the Reserves desk on the 1st floor of the Central Library or the service desk of the Architecture & Fine Arts Library or the Science & Engineering Library. The length of time you may borrow On-Site Reserves can vary from as little as 2 hours to as much as 7 days depending on the limits set by the course instructor. Please note: Be sure to return the on-site material by the due date and time assigned; reserve items accrue higher overdue fines than regular materials. Checkout - Equipment, Books, etc.